Finally in 1893 at the Chicago Worlds Fair people noticed him. His music was finally seen as a great success. After that, he moved to Missouri and became a piano teacher while he published his most famous work “The Maple Leaf Rag”. This made him very famous and was able to support himself for the rest of his life. Scott Joplin never quit playing. He published many more songs, had many more students, and played many more concerts. His music is very lively and complex. Playing it requires a fair amount of skill and strength. 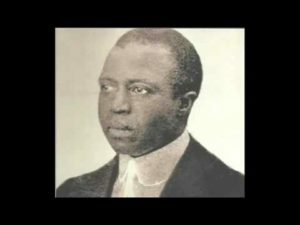 Scott Joplin died in 1917. He won a Pulitzer Prize after he died. The moral of the story is never quit playing. Keep practicing one day you will be able to play the music of Scott Joplin! If you like pianoparents.net tell your friends about us and let your piano teacher know about our sister site palomapiano.com where there are tons of free piano teaching resources. < Previous A Piano for Christmas?